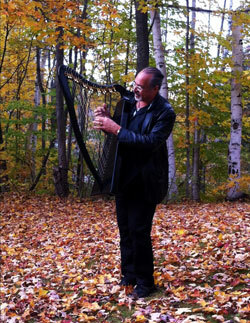 My new Marini "Bass Minstrel" harp is a joy to play! It is lightweight, so it is effortless to play for hours, even when it is strapped to me. Its beautiful tone is remarkable for such a compact instrument, but it features an extended range in the low end, making it great for playing the bass note of chords when normally it's just not there on conventional folk harps. I especially appreciate the custom black gloss finish. I love it! 33’’ tall, 12’’ wide, 21’’ deep, 6 lbs. 35’’ tall, 12’’ wide, 25’’ deep, 8 lbs. Our Guarantee: All harps are guaranteed against defects in materials or workmanship for 5 years from the date of purchase. If you are not satisfied, you may return it within 30 days for an even exchange or a full refund. I finally received the harp! My Bass Minstrel Harp has just arrived safely. 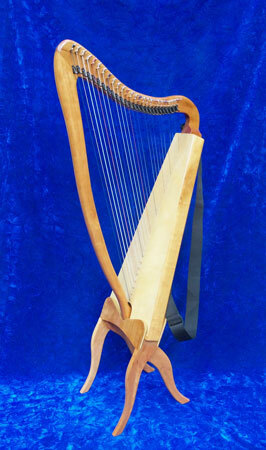 This is my first harp. And I can say that my choice was just right! Thank you for making such a nice instrument. I can't tell you how much I love it! If I have something to ask you, then I will contact you. Thanks to read it. I am a therapeutic musician who believes firmly that no hospital, skilled nursing facility, hospice, or church should be without an on-site small harp. 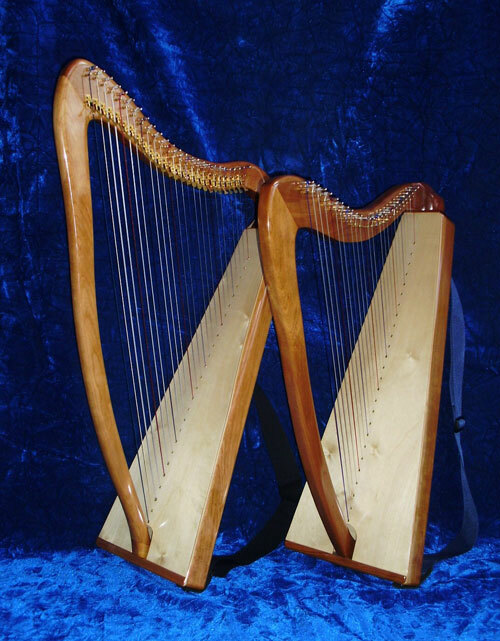 In my practice I have seen miracles of healing happen due to the soothing vibrations that flow from a harp. I have seen suffering and pain melt away at the “murmuring sound of the harp” when medicines and other instruments could not touch this suffering. The Marini Made Bass Minstrel Harp is the perfect size for use at the bedside. Its tone is so soothing due to the lower octaves of it. 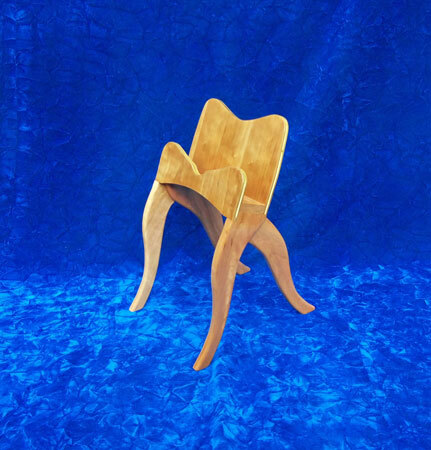 It is light weight enough so you can carry it easily and sit in any chair to play it comfortably. 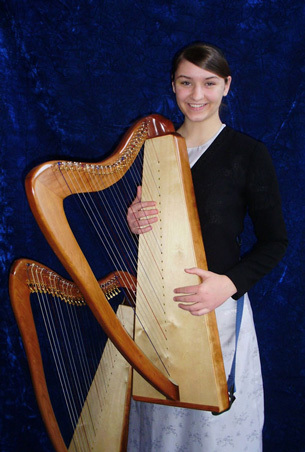 I have recommended this particular harp to hospices and skilled nursing facilities. A number of these facilities have purchased it already and some are in the process of raising funds to purchase their future Bass Minstrel Harp. 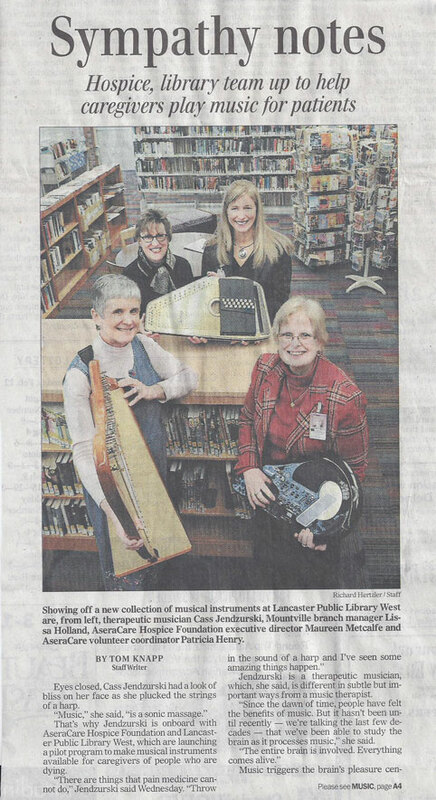 Cass Jendzurski (pictured on left) is holding a Marini Made Bass Minstrel Harp. Thank you so much for the beautiful harp. I picked it up at the bus station this morning, and since I knew I wouldn't be able to wait until I got home to unpack it, I came to work today armed with a electric screw driver to open the box. The harp is lovely, and the sound is lovely—it was so well packed, it hardly required much tuning! I've already serenaded my coworkers, and people were coming out of the office asking "is there an angel around here this morning?" It's a dark, rainy morning here in Maine, and the harp has already brightened the day for me, and for others. Thank you so much for your lovely workmanship—This instrument was truly worth waiting for, and I look forward to many hours of playing this harp for my hospital and hospice work. Sue, the stand has arrived. I LOVE IT! Makes it easier to play the harp and it is a stunning way to display it. Also, I notice a difference in the sound of the harp; it seems crisper now. Perhaps the basket on which I was balancing the harp muffled the sound somehow. Anyway, we are delighted with it and please tell Alex how happy I am that he designed the stand—I think you have a real winner with it and would guess you will sell many!